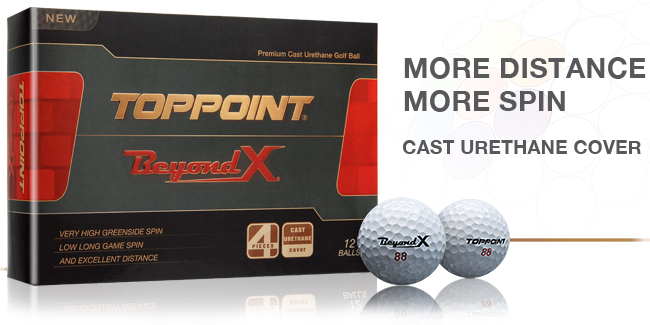 Toppoint “Beyond X” presents the cutting edge of premium golf ball technology. The new 4-piece cast urethaneconstruction allows the harmonization between long and short game. With driver and long iron Toppoint “Beyond X” delivers low spin and excellent distance. High launch angle and high spin for easier greenside control. Super spherical core, inner mantle, mantle, spherical tiled 336 dimple pattern combine with cast urethane cover provide more consistent flight in all clubs. High COR/low compression for excellent distance with soft feel. High COR copolymer to transfer all energy to/from the ball. Firm blended copolymer works with inner mantle and core for lower spin in long game plus excellent distance. Cast urethane works with mantle deliver soft feel on all shots and generates high greenside control spin. Dimple Spherically Tiled 336 Dimple Design.